With the current exception of A499 and A516 (see below), this property is open for the public to enjoy and appreciate. Before visiting, please review the GBLT Visitor Guidelines for maintaining the environmental integrity of the property. While there are still buildings on the recently donated cottage islands (A499 and A516), we need to ask that visitors to Thomson please not land on A499 or A516 – however the other sections of the property are open to visitors. The Thomson Reserve is a combination of both islands and mainland located just inside the Nares Inlet community. The first portion of the property, a small island, was secured in 1991. The second mainland portions of the Reserve were protected 10 years later in 2001. Finally the two cottage islands were transferred to the Land Trust from the estate of Robert Thomson in 2015. The property consists of open, shrubbed and treed bedrock with scattered clusters of vegetation, a diverse shoreline that includes pockets of Georgian Bay coastal meadow marsh communities, a small Eastern White Cedar forest and a locally rare Virginia Chain Fern bog. The property supports more than 90 plant species and is remarkably undisturbed. 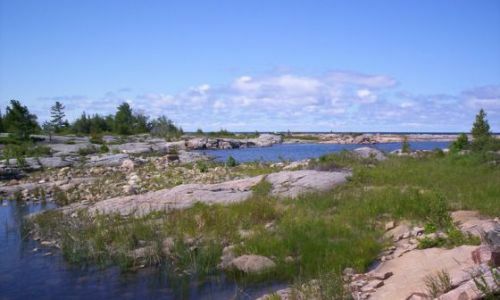 It is surrounded on the mainland by the very large Pointe au Baril Forest and Wetlands Conservation Reserve, and so contributes to an extensive natural corridor. The three Thomson brothers were very conservation- and community-minded, and their cottage served Nares generously for many years as a community meeting place. As a result the Nares cottagers have a strong connection and attachment to the property.